Homer Hailey was born in Marshall, Texas, August, 1903. After his father died in 1918 Homer's mother Mamie, his brother Rob and Homer himself worked at various jobs to support the f amily. In 1922 Homer joined the Christian Church in Willcox, Arizona but in 1926, he entered Abilene Christian College (A.C.C.) and thereafter worshipped with the church of Christ rather than the Christian Church. He began preaching for churches around Abilene and in 1930 married Lois Manly. He then spent one year as principal of Abilene Christian High School before moving to Tempe, AZ, to work with a small church there. Homer returned to Abilene in 1932, and spent eleven years preaching for the Fifth and Highland church. As that church grew to almost 400 members, Homer also held at least a dozen meetings for other churches every year. In 1934 Homer began teaching part-time at A.C.C. while studying at Southern Methodist University from which he obtained a Masters degree in church history in 1944. He preached in Los Angeles and for two years in Honolulu, before becoming associate professor at A.C.C. from 1948 - 1951. In 1951, at the age of 47, Homer became the vice-president and head of the Bible Department at Florida Christian College in Temple Terrace, Florida, and also began editing for "The Preceptor" while still preaching a heavy schedule of meetings during summer months when school was out. In 1954 Lois passed away, leaving Homer, and the children, Roma, Mary, Carol, Rob, and Dennis. Late in 1955 Homer married Widna Kirby. They left Florida College in 1973, built a home in Tucson, Arizona, and lived quite happily until she too passed away in 1997. 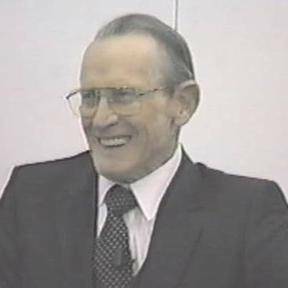 In his last 20 years, beginning in 1980, Homer would drive (or be driven) 29 miles from Tucson up to the little town of Oracle where he preached and taught until his death in November of 2000. It is during these last years of his life that the great majority of his classes available through this website were recorded. The author of numerous books, Homer is most famous for his commentaries on Isaiah, the Minor Prophets, and Revelation although he also penned superb studies of Job, Daniel, and John's Gospel. Homer also wrote concerning subjects such as Prayer and Providence, the Covenants, God's Eternal Purpose, and one very interesting study entitled "Attitudes and Consequences in the Restoration Movement" which deals with Church History. Giants of faith have walked on the globe. Courageously playing out each of their parts. Scanning the skies for Heaven's bright dawn. Steadfast and devoted when things went wrong. Listening only to God's gospel call. These are the men who lead us the best. These are the men who surpass the rest. Abram believed and Moses brought law. Setting examples without any flaw. Joshua, Gideon, wielded the sword. Valiantly fighting the wars of the Lord. With songs and verse encourage the soul. These are the men of whom we will sing. But life is a vapor, a mist in the morn. Man heads for the grave the day he is born. The prophets have vanished, gone like a dream. Long since departed and left the world's scene. The giants of old have all passed away. Have we no heroes to guide us today? To whom may we turn for examples in life? Who has endured and conquered the strife? Where is a man whose example is true? Where is a man to guide me and you? "There stands a Christian. He knows the way." Fear not my dear friend, nothing is lost. There yet lives a man who counted the cost. One humble man who paid the full price. One gospel preacher with a sage's advice. Like John the Baptizer in a desert today. And who is that man? He's Homer Hailey.